We have finally moved and I can't tell you how good it feels. Being able to walk out to the park or to a shop, without having to pack what used to feel like our worldly belongings in to the car is a revelation. Convenience on our door step and I love it. Relatively speaking the move went quite well. I prepared a few meals in advance to bring with us, as I knew that despite labelling box after box with its contents, (so organised, I even shocked myself) it would still be impossible to find that one utensil or ingredient when the moment arose. So a couple of batches of soup, some sweet potato, leek and lime fritters, a batch of raw chocolate shortbread squares and a quiche were prepared without any need for the oven. Convenience is brilliant, I mean a huge amount of us are now living in this 24 hour convenience led society where everything we could possibly want or need is on our doorstep; at the click of a button, or the swipe of a card. We can get things delivered to our door in minutes and the choice is endless. However, when it comes to food I have to be very careful. Just going out and grabbing a simple takeaway; pizza, sushi, pasta etc, might seem like an easy option but it isn't for me. For years I pretended it was. I joined the crowd, I ate and drank everything that, to be honest, was toxic for my body. By toxic I mean it left me pumping myself full of insulin, having terrible bloating, tummy ache, lethargy and then dealing with the highs and lows which came with over injecting. It's hard to explain to someone without diabetes what it's like to actually have it, but the best way of me explaining it is to put you on a roller coaster and not let you get off. Even just having one slice of pizza, despite the initial mouth by mouth enjoyment, would leave me trying to calculate how many carbs are in that one slice, what my current blood sugar is at that time, what I will be doing after the pizza, what I am drinking AND how my mood is (trust me, happy, sad, anxious + hormonal all add to a change in blood glucose). Maths was never my strong suit and trying to make calculations on what food you're eating really does take any enjoyment out of the moment in time. So, to be able to create recipes where I don't have to make calculations, or if I do only very small ones, makes such a huge difference to my life. Years of feeling ill, years of hating diabetes, and then suddenly the realisation that I can enjoy food in abundance without the sugar roller coaster has ultimately changed my life. 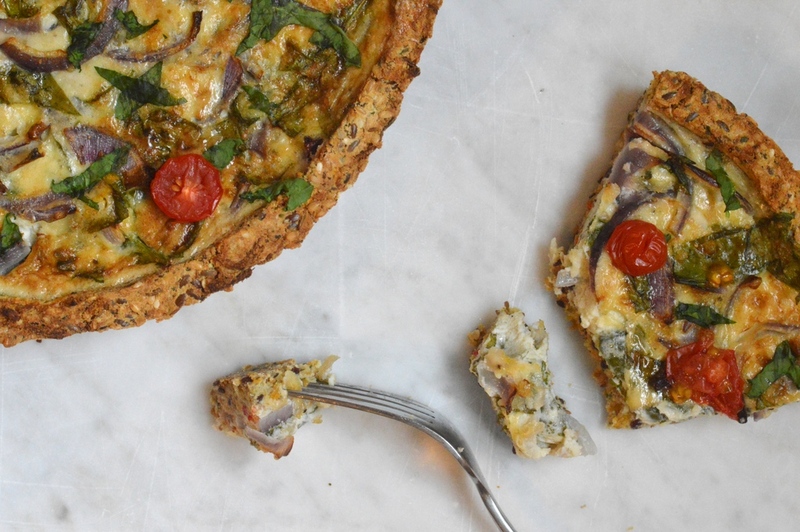 This quiche started as a bit of a 'throw it all together and hope for the best' recipe. But no sooner had I made it, I made it again and It was a triumph. So much taste, texture and as delicious straight from the oven hot as it was cold. The base is thick but doesn't crumble, unlike a lot of shop bought quiche. It is infused with fennel, which adds flavour and warmth. The filling is cheese and onion which has always been one of my favourite flavour combinations! Packed full of yumminess and one for the whole family; even my little toddler adores a few pieces. Especially perfect for those who cannot tolerate gluten or grains. The base is made with celeriac. Celeriac is not only low(er) in carbs than all it's fellow root vegetables but it is also contains plenty of vitamins, minerals, and dietary fibre which benefit your cells, bones, and immune system. Celeriac, also known as celery root, knob celery or turnip-rooted celery, is a root vegetable that belongs to the same plant family as celery. It’s known for its distinct appearance. This appearance features a round base with multiple knobs and protrusions. It also has a leafy top, similar to a turnip or radish. A lot of people ask me which baking dish I use with my quiche and pie recipes. I use this baking tin which I have had for years. You can buy it here. 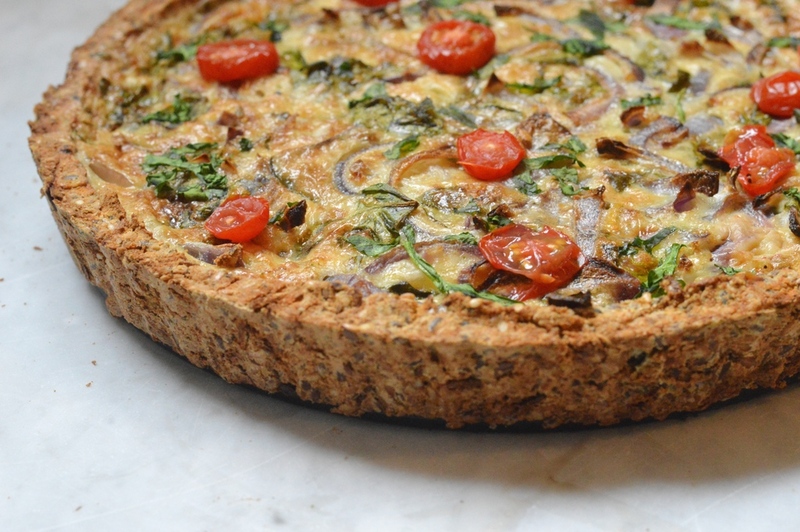 A deliciously simple and flavour packed quiche. Perfect for the whole family. In to a food processor / coffee grinder pulse the mixed seeds until coarsely ground. In to a large mixing bowl add the mixed seeds, fennel seeds, sea salt, pepper and coconut flour. Combine well. Mix in the grated celeriac and then slowly add in the egg, mixing as you do so. Add in the whole grain mustard and water, a little at a time until a dough is formed. You will want to start combining it together with your hands. Once the dough has come together, press it in to a greased spring form pie dish (I use a 31cm spring form pan - here). You could alternatively roll it and cut it to shape but I prefer to press it in as it's quicker, more rustic and much easier. With a fork prick the bottom 4-5 times all over before placing in to the oven for 10 minutes to blind bake. Remove from the oven and allow to cool for 10-15 minutes before adding your filling. In to a large bowl add the coconut milk (or double cream) and eggs. Whisk together well. Add in 100g of the grated cheddar cheese and mix in well. Fold in the spinach and red onion. Pour the mixture in to the base before placing in the oven for 25 minutes. Carefully remove from the oven, add the remaining cheese to the top and the cherry tomato halves. Bake for a further 15 minutes until the centre has fully baked and the top is golden. Remove from the oven and allow to cool for 15 minutes before serving or allow to fully cool before covering in foil and placing in the fridge until required. I grate my sweet potato in a food processor. I have also done it by hand. When doing it by hand I find it is always much wetter and thus requires draining of excess liquid before continuing the recipe. To do this, add all the grated potato in to the middle of a clean kitchen towel. Bring up all the corners and then carefully squeeze out any excess moisture. I know the nightmare of blood sugar rollercoasters well, which is why I love recipes like this! I made this last night and it was delicious. The filling’s so simple yet tasty. I ended up with more base than I needed (I like my crusts quite thin) so I baked the extra into crackers — yummy with slices of cheese. Thanks for another fab recipe, Emma!